Peter Zeihan predicts a major famine coming. As it happens I have been working on a "System" that in my opinion could provide energy, water, and food on Earth, and I think also on Mars. So, Here I am again for that reason. I will clean this up later, it is an adaptation of something I intended for a different recipient. But you are the only place for me to put it. You didn't stop me, so I did put it here. (Granted, you have seen some of this before). My objective actually is to get rid of it. I would like to go on my diet again and loose another 5-10 pounds. When I work on this type of thing interferes with my ability to have self restraint. I have decided to return for this item. If an appology is required, then please consider it offered. I intend to use this site to "Publish" a set of ideas that I was unable to pass off to my original intended recipient. While I will respond to any possible questions from the membership, I actually aim this at a wider audience. If there is no such audience, then I will have done as much as I am required to do and can leave this behind. My hope is to map a notion that could be performed on Earth, eventually at a profit for the human race, and that it's methods will be reasonably adaptable to Mars. 1) Satisfy human needs on Earth to put off an Easter Island type fate for humanity. 2) In doing #1, to rehearse methods, and create tools to make Mars much more habitable. First of all this calls for another type of "Loop", a "Vapor Loop". This would be a tunnel which has a partial vacuum largely filled with water vapor. This would be the backbone of a "System" of processes. The nominal pressures inside would be variable (For a reason I could explain). Compromise would be expected for any vehicle traveling within as to speed, because the vapors would serve many other purposes. I propose pressures within from 5.5 Millibar to perhaps 30 Millibars primarily of water vapor, but not exclusively water vapor as a requirement. (The option of higher pressures exist, but at this time are not my preference). I intend that this "System" would be a rehearsal for a similar one to be implemented on Mars, but I hope that the similation will largely pay for itself on Earth, and will show a new way for large numbers of humans to live on Earth with reduced burden on the natural resources of Earth. It has recently occured to me that portions of lava tubes on Mars might also be incorporated as part of the vapor containing process if it is implemented on Mars. -Solar and Wind Power, in addition day and night thermal cycles. -Solar and in addition, massive day and night thermal cycles. (That's a real biggie on Mars, I think!). (It is another type of solar actually). -Solar Cisterns/Greenhouses/brine ponds (This is a big item). Solar Cisterns would be water retaining enclosures which still allow some wavelengths of light to enter the enclosure. The greater amount of them would likely contain brine. However a minority would be fresh water enclosures. The brine enclosures can have different salinity levels at different water column levels. This would be like a solar pond, or an Antarctica dry valley lake. *Note: The ice in the above picture is likely VERY thick, still light enters the lake and some photosynthesis is likely. For a solar cistern, I do not think such a thick layer is necessary. In fact, no ice is needed, if your roof for the solar cistern can hold sufficient pressure. However, I think the ice method would be more fool proof. *Note: On Mars, a reasonably thin ice cover "might" (Or not) be considered an advantage in a Solar Cistern. For one thing you could walk on it, to service the "Roof" structure above it. Also, the pressure could be at Martian ambient and average of ~5.5 mb, if the surface temperature of the ice were considerably colder than 0 Degrees Centigrade. And that is quite possible to arrange on Mars. So, your solar cistern on Mars would not need a pressurized structure above it's ice layer. The "Roof's" primary functions would be to prevent sublimation of the ice into the Martian winds, and to allow selected wavelengths of light through. In addition it may be that ice will block some of the U.V. If not, then U.V. blocking pigments could be added to the ice. However, ideally, the "Roof" would use all of the U.V. in photovoltaic generation of electricity, so that would not be an issue. If you study Dry Valley Lakes, you will find that the bottoms of them can be at ~Room Temperature (Suitable to human scuba divers). Those levels are anoxic, warm (~Room Temperature), and more salty. The water below the ice, often is aerobic, cold, and less salty. For Solar Cisterns, the Oxygen values at various levels in the water column could be arranged according to preferences. Anoxic is not a required condition, but it could be a desired condition. ⦁ The approach is, particularly, attractive for rural areas in ⦁ developing countries. Very large area collectors can be set up for just the cost of the clay or plastic pond liner. 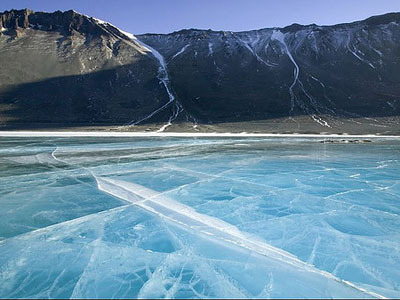 (On Mars, perhaps a permafrost barrier could be used to prevent leakage from the pond. Perhaps....Temperature of the bottom water, and salinity will be the determiners of the effectiveness of such a method). ⦁ The accumulating ⦁ salt crystals have to be removed and can be a valuable by-product and a maintenance expense. (For a solar cistern, maybe this would be made to ocur, or not). ⦁ No need for a separate collector. (Separate collectors would be just fine in this system). ⦁ The extremely-large thermal mass means power is generated night and day. (And this makes it possible to expoloit day night temperature differences, particularly on Mars, but also in the deserts of Earth). ⦁ Relatively low-temperature operation means solar energy conversion is typically less than 2%.⦁  (Not an issue for a Solar Cistern, as high temperatures can be generated by compressing low pressure steam with electric power, electric power that can come from many sources). ⦁ Due to evaporation, non-saline water is constantly required to maintain salinity gradients. (A solar cistern will not have this problem, it is designed to prohibit evaporation into the atmosphere and it will generate plenty of fresh water as it will part of a system that has several methods to desalinate water, and at the same time create intensified brine). -The use of salt gradients to generate electricity (This is associated to Solar Cisterns and other items). "It’s early days, but the team have boldly suggested that this hybrid technology could generate up to 40 percent of global electricity demands, without a sizable carbon footprint to boot. Is a new type of renewable energy about to walk onto the global stage? Watch this space!". -And yes chemical energy, such as Hydrogen, Carbon, Methane, Oxygen. (Please see the next line). *For the above item, I do not intend a "Hydrogen Economy for cars, but for food production", a solar driven chemosynthesis. (Technically U.V. Photo/Chemosynthesis on Mars). 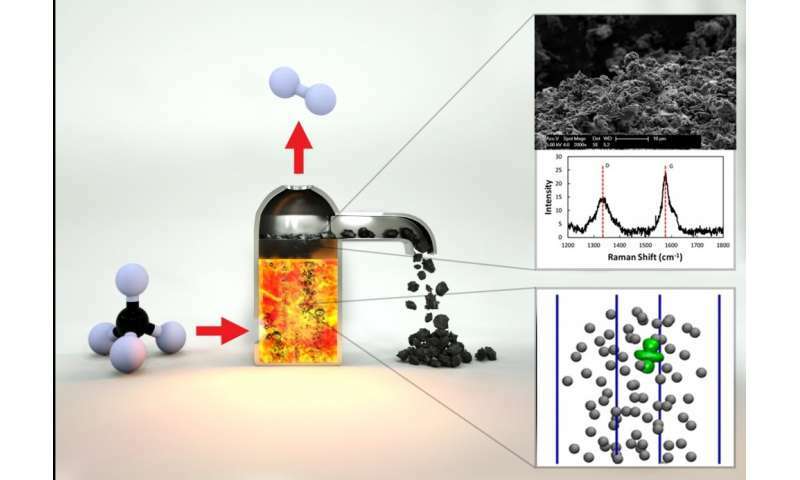 Carbon could be used to make parts, or to make Methane (Again). "Bacteria use hydrogen, carbon dioxide to produce electricity"
*So now it looks like we could find a way to consume CO2 and produce biomass, and maybe even electricity. So if your solar cistern needs more Carbon, you might even burn natural gas to produce CO2 for it. *Maybe we could have it all! Both on Earth and Mars! These greenhouses just allow the necessary wavelengths through for plant growth. Also if you can utilize the U.V. it is even better, as an enclosure for a solar cistern. So what I want is solar cisterns which generate power, and chemicals to drive living systems "Chemosynthesis", and which also provide clean water and food. -A partial vacuum as a method of storing energy and transmitting it. -Maybe the ability to deeply reduce the greenhouse effect with a expanding solar cistern (Greenhouse) effect. Absorbing Carbon into Carbon parts, and Plastics for the structures. I expect that the Salton Sea might be rehabilitated with the mentioned items, and also some not mentioned items. The salt will be a raw material to make the brine. Expanding amounts of solar cisterns. I hope that some entity would recieve consideration from governing entities, such as grants and tax advantages for doing a pilot project for the development of methods that might save the "Salton Sea". (Supposedly it's fishery will go belly up in 10 years). What I expect from this "System" is food, from solar energy, and also chemosynthesis (Driven by various methods), clean water, energy storage by quite a few methods (Providing load leveling), shelter for humans. Environmental cleanup, such as the elimination of much produced greenhouse gasses. I expect salt to become a useful product to be used in solar cisterns, and so expect that it would make sense to extract it from places such as the Salton Sea. The energy cycle might be like this: (The mentioned items are typically suggested options, not necessarily requirements). During the day, store as much accumulated heat in the lower layers of a solar brine pond inside a solar cistern enclosure as is calculated to be the best benefit. Pull down the vacuum inside of the vapor loop, creating a greater partial vacuum, and accumulating heat to dump into the lower layers of the brine pond. Also creating distilled water. If it is required to cool the upper portions of the solar cistern to protect farming in that area, then using vacuum driven evaporation (Possibly by allowing steam to be vented from the upper layers of water in the solar cistern, into the vapor loop). Early night. Vent heat from the lower layers into the vacuum, perhaps even driving turbines, re-filling the vapor loop with more water vapor. Any distillation process will create fresh and more concentrated brine water. This can serve as a stored energy source, if a method to generate electricity from salt gradients is used. I suggest that human housing would be implemented all along the route, and that instead of using freshly distilled fresh water, instead use that for people, and then take their "Grey" water and generate electricity from that "Grey" water and a concentrated brine. (See the previous mention of electricity from brine gradients). And along the entire length of the vapor loop, wind generated power could periodically pull down the vacuum as well, and as well generate distilled water from both compression, and a cool outside environment. On Earth, this would require heat exchangers which could recieve the compressed steam, possibly during times of high wind especially. On Mars, with no significant wind power, instead, a double condensation process could be used. That is a fluid with a higher vapor pressure than water, perhaps an Ammonia mixture, could condense in a heat exchanger exposed to the generally cold Martian surface environment. 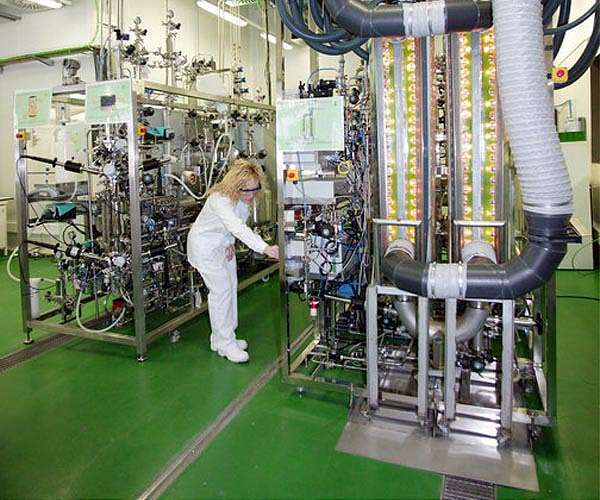 That cold Ammonia could then be used in a Water Condenser/Ammonia Boiler, to both condense water from steam in the vapor loop (With very little or no forced compression), and to also perhaps even boil the Ammonia and turn turbines. On both Earth and Mars this would of course generally work best at night and/or in a cold season, and I think would be just crazy powerful on Mars. I can go on and on. There is the issue of food production from solar energy, chemical energy. I also expect this system to be capable of "Digesting" gasses such as CO2, and Methane, and also to be able to produce Methane, if that is desired. Producing food, and also possibly building materials. It might alternately produce chemosynthesis food from coal or natural gas if that seems worth while (This could be useful during a nuclear or asteroid strike winter). Ask me, and I will elaborate. Certainly if there are two primary types of solar cistern, fresh water and brine, some type of greenhouse activity could go on. As I have mentioned methods will be employed to keep the temperatures temperate where it matters. There are many possible schemes. Duckweed on fresh water. Potted plants hanging from roof trusses (Perhaps made of Carbon). Floating Gardens. These people have done good work. However I want to see it even better. It seems to me that as they are doing it in the sea, they have limits on how close to the surface they can expose their domes. However if the domes were to be in a solar cistern, they could be just a small space below the surface. Being immersed in water, temperature fluctuations should be strongly buffered, but being near the surface, the sunlight will be attenuated less. In the case of Mars, the "Attic" air pressure could be nearly the same as Martian ambient. Perhaps 10 mb? This will strongly reduce the strength requirements for the outer transparent/translucent agricultural enclosures. The underwater "Nemo Garden" domes can have air pressures much higher, to accomodate plant crop growth. If the dome were 11 feet tall, then the air pressure inside will be ~1333 mb on Earth + the water collumn pressure above the dome + Atmospheric Pressure. On Mars it would be ~1/3 + Water Column + ~5.5 mb. (Unless you gave it a sleeve that extended further down, and then you could have air pressures as high as your material could hold. 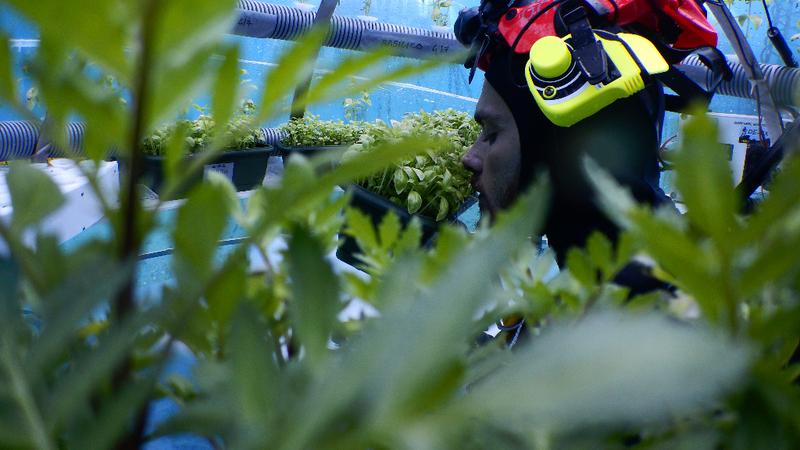 The Martian farmers could have pressure suits that would be like scuba gear and they could swim up to lower pressures and work the farm. If they depressurized, there might be a tether attached to them that would pull them down to greater hydrostatic pressures enabling their survival/rescue. Alternately AI/Robotics could do the farming. Or a periscope and manipulator arm would allow people on the bottom of the cistern to see and manipulate the contents of the Nemo Gardens. Or the Nemo Gardens could be pulled down to the bottom for servicing. Lots of alternatives. I am actually very interested in what this could do on Earth. Another option would be to have sealed pressurized transparent canisters filled with water, perhaps fresh. The canisters being on tethers anchored to the bottom of the cistern. They would be pulled down periodically to lower levels in the cistern where the hydrostatic pressure is higher, to manipulate the contents. Some vascular plants might be farmed. Also Spirulina. I am actually more interested in developing aquatic plant agriculture than plants that largely are in the atmosphre. Now for livestock, I am interested in Brine Shrimp. There will be other alternatives, but brine shrimp are an interesting one to consider. The Native Americans used to eat them. Birds eat them a lot. 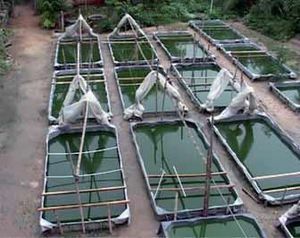 They are also fed to fish for aquaculture. They are filter feeders. They can live in brine which would kill most possible pests which might harm them. As for the birds, they can be kept out by the roof of the solar cistern. This should work well on Earth. For Mars, some additional thinking will be required. While they are an animal that typically best enjoys photo micro-ogranisms to eat they can also eat other micro-organisms. This is where I see the power. Chemosynthesis driven by solar power should be able to provide those micro-organisms in massive amounts. They are in nature rather small. However it is possible to speculate that the evolutionary pressures that keep them that way might be altered by keeping predating birds away, and by supplying lots of food and optimal conditions. Or maybe not I do not know. As for normal livestock, such as cows, if they were housed in buildings connected to the solar cistern, all of their output could go into it. Their Methane, their CO2, Manure ect. So then not ejected into the atmosphere. As you must see by now, I have very much more material to present, but this is just an introduction. Why don't we see if we can feed everyone, get them water, and energy? Also lets go the Mars and other places and do similar things. My understanding is that when the Potatoe was introduced into Europe, the magnitude of the gain caused a period of peace, as resources became abundant. We should want to cause a similar thing now, to buy time, to get the human race multi-planetary. Other options are farming filter feeding fish, in less salty water. Mostly composed of species in the genus Bathymodiolus, these mussels do not directly consume food. Instead, they are nourished by symbiotic bacteria that also produce energy from methane, similar to their relatives that form mats. Chemosynthetic bivalves are prominent constituents of the fauna of cold seeps and are represented in that setting by five families: Solemyidae, Lucinidae, Vesicomyidae, Thyasiridae and Mytilidae. These may or may not be edible. I have not found confirmation one way or the other. I'm not sure that they can be grown in a solar cistern. -Food from Coal and Hydrogen and Sunlight? I am hoping to create a market for Coal that ends up as a source of Plastics and Carbon parts. The proposed method: A solar cistern would have water in it. Several options are available. This one supposes, water not too salty for the livestock (Aquatic Organisms) in it. (Brine Shrimp, or Fish, or other?). Three sources multiple sources for a bioweb are to be incorporated. Ideally Coal of a particle size that is most compatible with the livestock, being placed on the bottom of the cistern. Hydrogen is to be imposed by some safe means into that same location and held at it by water stratification. For instance Hydrogen could be compressed to disolve into that bottom water at a rate that does not impose a risk of it migrating to the surface. So, these are two "Fuels" for life. While the bottom layer could be kept anoxic, in this case I speculate for the inclusion of Oxygen in the waters also. Properly monitored and controlled, Hydrogen and Oxygen disolved in the bottom waters, in contact with coal particles on the bottom should not present a explosion or fire hazzard. I have hopes that the PH will be tollerable to the life forms by the balancing of Carbon and Hydrogen, but I am not sure at all about that. Other methods to balance PH may be needed. At the surface the cistern "May" have a transparent top to allow solar wavelengths that promote photosynthisis into the surface waters. The intention is to promote to growth of life that can be edible. North America has much Coal, (And Tar Sands might also work.) and my understanding is that many places in the world face likely starvation in the future per "Peter Zeihans" opinion. The method listed above if it works would produce food from Fossil Solar Energy (Coal, Atmospheric Oxygen), and Solar Energy (Photosynthesis), and electricity that produces Hydrogen, Oxygen, Carbon from Water or Methane. The electricity can come from any source. Solar, Wind, Nuclear(Fission or Fusion), and all of the others. So, enormous food production from this process in North America for one, that could be "Sold" to populations of the world which might become unrestful. Such unrest could damage our ability to maintain a space effort. If it were dammaged enough the human race might not have the ability to access minerals and solar energy in space to further sustain human technological "Civilization" on Earth, Moon, Mars, Venus, and other places. So, now this food would be consumed by living organisms, and they would produce feces, and normally that would be Oxidized, so emitting CO2 into the atmosphere. However, I propose that toilet flushes, and manure, could be processed without Oxygen, to extract all of the Carbon from the waste material, and to produce Methane. The Methane would not be Oxidized, but would be processed either to produce Plastics, or Hydrogen and Carbon parts. A special Cistern for this would be built with the following characteristics: It would be filled with very salty brine. The interior would be anoxic, lacking significant Oxygen. The waste would be mixed in with the brine. The intention here is to kill any organisms which were emitted with the waste materials from the humans or animals. Most organisms humans have in their bodies would not do well in strongly briny water. Hydrogen would be added to the Cistern, preferabley in the waters. (Perhaps any air gap above the water would be filled with a mixture of Nitrogen and CO2, but preferably Methane). Extreme organisms which could live off of the Carbon in the waste would also consume the added Hydrogen. I would expect them to produce Methane. The Methane then could be extracted and converted to Plastics or Hydrogen and Carbon Parts. While the USA has enormous amounts of Natural Gas, some locations on the planet do not, and by shipping food to them and then converting the waste from humans and livestock into Methane, it is a way to feed those places, and to also sell them a source of Methane, Plastics, Hydrogen, and Carbon Parts. If so, this could also tend to stave off an Easter Island kind of descent of the Earth into darkness before humans could become Multi-Planetary. When a batch of this material had properly had it's Carbon extracted, a further method to process the residue would be desired, to extract the nutrients from that residual. I will not work on that yet. (Getting a fertalizer from it). I don't think that most of the USA would bother with getting Methane from manure/feces, but perhaps California would like it as a green notion. Also some countries without large supplies of natural gas might like it. It is my opinion that it would be useful on Mars for sure. But what about Mars? Of course Methane could be made of water and CO2 as Elon Musk says is the intention of SpaceX. I do know that a tiny portion of the atmosphere is CO, and O2. I would hope that this could be extracted, but I don't have a method yet. I have encountered extreme resistance to the above from others, and all I can say is "I don't know one way or the other". Abiotic Oil is a No-No in most circles. It is usually treated as a Heracy. However aboitic Natural Gas is still a possibility by geochemical reactions. Biotic oil might have occured if there was life on Mars in previous times. For now, my primary wish would be to find a way to extract the naturally existing CO from the atmosphere. The Oxygen as well, if somehow possible at a resonable price. So, I believe that chances exist to produce food on Earth in large quantities by the method(s) suggested above. If that works then I speculate that a similar thing could be done on Mars. My feeling is that hydraulic fracking from within a lava tube should be considered. If it does not find Hydrogen or Methane, it may bring up brine which could hold evidence of life, and also it would likely bring up minerals such as Lithium and other minerals. Inside of a pressurized section of lava tube would be a probable good place to exloit these presumed resources, and of course brine has water in it. Back on Earth, finding a use for improved fracking brine would be wonderful. I propose to use it in the same manner as would be used salt water from the Salton Sea for instance. If done, then this would reduce or eliminate the Earthquakes which result from interning fracking brine back into the Earths crust, as the amount injected back into the crust could be reduced. *Note: I only include this part as an amusing thing to contemplate. It is actually sort of off topic, but if Lava Tubes were included in the "System", then a historic source of lava is needed. I am most interested in the answers to the questions contained within it. Don't believe I will get those answers anytime soon. I wonder if BFR could land on the top of Olympus Mons? I simply don't know. If it could, you might claim that it is not likely that you would be disturbing a place where life is likely to be found. (Just be careful with any possible active volcanic vents!) Further, if I am not mistaken, there should be a slight advantage for taking off again, as it is near the equator, and has altitude. The altitude reduces the amount of air friction for take-off, and of course you are already just that much nearer to an orbital position. 1) Maybe there is ice in lavatubes on such mountains on Mars. 2) It is speculated that there are rocky glaciers near the top of Olympus Mons. Perhaps with some ice in them. 3) In the worst case, get Hydrogen from high latitude low altitude locations, then fly BFR to the top of Olympus Mons, and collect your Carbon and Oxygen. Tricky business of course, but everything SpaceX does is extremely tricky already. As far as global dust storms, I would think that the cauldera of Olympus Mons would be reletively sheltered, and would have a very intense U.V. flux. I know that in Japan, methods have been developed to collect energy from U.V. by converting it to other wavelengths. The intense U.V. flux would be another argument you could make justifying landing there, as it would tend to kill microbes brought from Earth. The air pressure at that altitude would also make liquid water very unlikely. That along with the cold would make it very unlikely for life to exist on the surface at all, I should think. Therefore a justifiable first landing place on Mars. *As for lava tube skylights, I suggest that we could hope to smooth out the debris inside of one, and make it into a landing pad for BFR. Allowing much heavy equipment to be off loaded into the lava tube. I am not entirely math stupid: (But I might be using the below with inaccurate thinking). Burning Methane in Oxygen should yield primarily H20 and CO2? Oh well, I am not second guessing them. I am just curious why they will do it the way they want to. Perhaps another issue beyond refrigeration and containment is the volume and mass of the tank to hold the Hydrogen. However if you had a big tank that you could discard from the cargo bay after the Hydrogen was used up in making Methane, that artifact could be left behind as a possible shelter. Cover it with regolith. But lots of trouble getting it to the ground and buried. Still, if the tank for Hydrogen were to become useful cargo in itself, then it comes closer to making sense to think about. I better shut it down and concentrate on things I actually can do, such as loose weight and build muscle. Well, that's good enough I think. I am off the hook, if nothing comes of this, it is not my fault. I presented, it. Hopefully someone will take/adapt something from it. I will play peek-a-boo for a little while to see what is going on with your site and particularly this thread. If nothing, then so-be-it. Just so you know the last time I left, I was not tempted to view anything here, until I had the need to post this here. I hope the rest of you will enjoy this site. SpaceNut mentioned this in another post. Been a bit rough on SpaceNut. Thanks SpaceNut, think it is a good piece of thinking. Could fit in very nicely. I am slowly starting to go through all of the stuff in this post and its alot so I will comment slowly to things that I am reading about, some of this post we have talked about elsewhere as well for the developing of an eco system that will aid man on mars. The initial fish bowl size is the technological issue for construction on mars....Not only is this a domed structure to some extent for man to live in with an active filter of the solar UV radiation via the solar cell materials but it allows for a greenhouse as well as aquatic life supports as well. this is a regular solar cell construction. 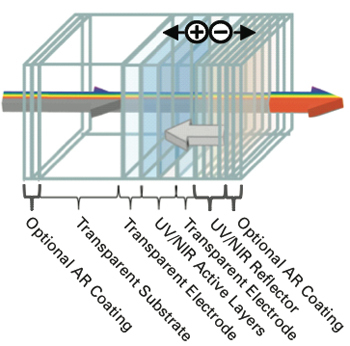 •Complete development of gallium-indium-nitride photovoltaic cells. This was discovered by the Los Alamos National Laboratory, they went to UC Berkeley to fabricate a prototype to test it. Paper published in year 2000. It works. 2 junctions produce 56% conversion of sunlight to electricity, 3 junctions 64%, 36 junctions 72%. A later scientist calculated optimum configurations for 2 through 8 junctions; 2 and 3 produce the same as UC Berkeley calculated. 8 junctions produce 70.2% conversion. Ok, so 8 junctions is optimal for this chemistry. A house roof that *IS* photovoltaic. Not couple small solar cells nailed to the roof, but the roof as nothing but solar panel. With solar thermal mounting and transparent protective cover to protect from snow and hail. This means photovoltaic and active solar thermal in one unit. Don't obsess over the cost of each cell, instead focus on cost per watt. I they can be mass produced at the same price as current solar panels, but produce 5 times as much power as those currently available for domestic use, that means 1/5 cost per watt. The layers are made with different obsorbing materials that have different light properties such as the clear uV cells only for lower light frequecies or color as some see the wavelength. A decade-long quest to build an ecosystem in a room known as MELiSSA. ESA is working with partners to create a contained system that will eventually and continuously convert carbon dioxide, urine and organic matter into fresh air, water and food - almost indefinitely. bio-reactors full of bacteria or microalgae to develop systems needed to deliver a full meal, fresh drinking water and clean air in space. I will read more tomorrow about the energy and mass demands to bring this system to mars. "If I eat any more of these algae cakes, I’ll turn into a green glob," murmured Lieutenant Sanders. He made a wry face, then stretched out on his contour couch in the pressurized space station. "It’s great being back on the moon again, but I’d give my Jet Pak for a good salami sandwich." Jo Ann Harvey lifted her space helmet from her shoulders and gently hooked it on an aluminum rack. Although her face was drawn and troubled, she forced a wan smile. "Bruce, I’d advise you not to let Captain McAllister hear you complain like that. Those algae cakes are his pride and joy." "But they taste like cardboard! ", protested Sanders as he pushed a final green crumb into his mouth with the tip of his thumb. "He keeps saying he’s worked out a formula that makes `em taste like Italian pizza … but they still taste like cardboard!" The girl sat down and expertly removed her weighted space boots. She sighed heavily. "Nothing like space boots to make a young woman psychiatrist resemble a baby elephant! Say, isn’t it your turn to go duty as officer of the day?" "Right," said the lieutenant, standing up. "However, since none of us is getting any sleep during this first twenty-four-hour period, I’d say we are all acting as officer of the day!" " That’s because Major Mason wants every Nucleus Two project to be in working order before we go over the rim of the moon and wake up my hibernating brother, " replied Jo Ann. " 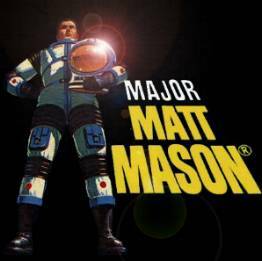 I’m sure he’ll be all right," commented Lieutenant Sanders as he zipped up his bulky space suit. But his voice was without conviction. He walked heavily toward the revolving air-locked door that separated the moon’s vacuum from the air inside. "Those hibernation pills are good for three months. There’s nothing to worry about. You know where he is. He’s sleeping like a baby at the bottom of the thermal tube." "I hope you’re right," mused Jo Ann. She removed a slender gold tube from her blouse pocket and applied a touch of pale lipstick to her mouth. Then she wearily leaned back on the couch, rested her tousled head against the inflated cushion, and closed her eyes. As though they were projected on a movie screen inside her head, the events of the past few months flickered fitfully in her mind as she dozed off. Captain Otto Harvey’s strong-jawed face glimmered first on her mental screen. Called "Squeak" since his Air Force Academy years as Major Mason’s roommate, Otto was now famous throughout the civilized world as the "Lunar Robinson Crusoe." The lovely young flight doctor stirred on the couch. Her fingers twitched with nervous fatigue. Captain Harvey had received the nickname because he had volunteered to remain alone on the moon for several months following the space expedition known as Nucleus One. The purpose of that initial lunar probe had been to establish temporary bases for complicated power plants and pressurized living quarters which would be established when more supplies had been sent from Earth in the follow-up expedition, labeled Nucleus Two. Encouraged by Major Mason, who was in charge of all lunar projects, Squeak had had a thermal tube the size of a living room sunk into a protective crevice on the far side of the moon. Here, in a hostile environment characterized by great extremes in temperature, he was to observe the effect of prolonged isolation on his body and mind. The thermal tube was cleverly constructed so that the range in temperature would be minimized. A platelike grid receptor on the upper lip of the wide opening captured fierce solar energy during the month-long lunar days, to be converted into instant warmth during the month-long lunar nights. The tube had several other interesting features: Twin holographic television cameras made possible the transmitting of crystal-clear three-dimensional pictures to central control stations on Earth. There was a microwave radio transmitter-receiver that could also operate on laser beams, and a computerized portable decoding device. Of course, there was a generous supply of concentrated food packaged, like toothpaste, in tubes, which themselves were edible. Last, but not least, was a reserve supply of Captain Kirk McAllister’s famous algae cakes---though Squeak had swore that he would rather starve than eat them---and a hibernation pill the size of a golf ball, to be used only if the follow-up expedition had to be postponed. The pill would immediately slow down all body functions in order to preserve the precious oxygen supply until the arrival of a space rescue team. Jo Ann Harvey moaned softly in her sleep. Despite the lieutenant’s words of reassurance, she felt certain that her older brother had perished. Her restless mind continued to churn, and visions of her brother passed before her.